I’m about to start a new frame for my friend Gary. He’s asked if I can document it’s progress so I figured I’d write about it here. There’s also a flickr set with the images for the build. The design of the frame is mostly Gary’s with some input from me as we went along. Not sure quite what the inspiration of the design was but it’s meant as a replacement for his current full suspension bike. A Gary Fisher Cake. One of the main aims of this bike was to produce a riding position as similar to the Fisher as we could get. I think this’ll come pretty close. 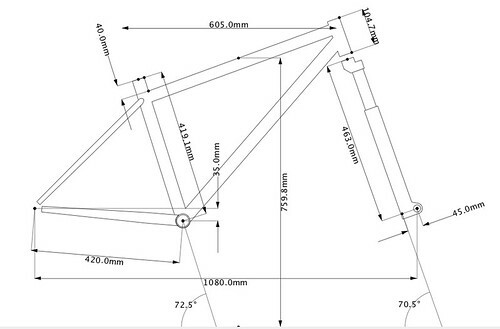 It’s a fairly standard sloping top-tube frame designed round a 120mm travel fork. Columbus tubing, Ritchey socket style dropouts, s-bend chain-stays and a huge 35mm seat-tube (more on that later!). Anyway, I’ve not cut or burnt anything in anger yet so I guess we’re still officially at the design stage. Here’s a dimensioned drawing to get started with.